I have a server running Server 2016 Core acting as a hypervisor. 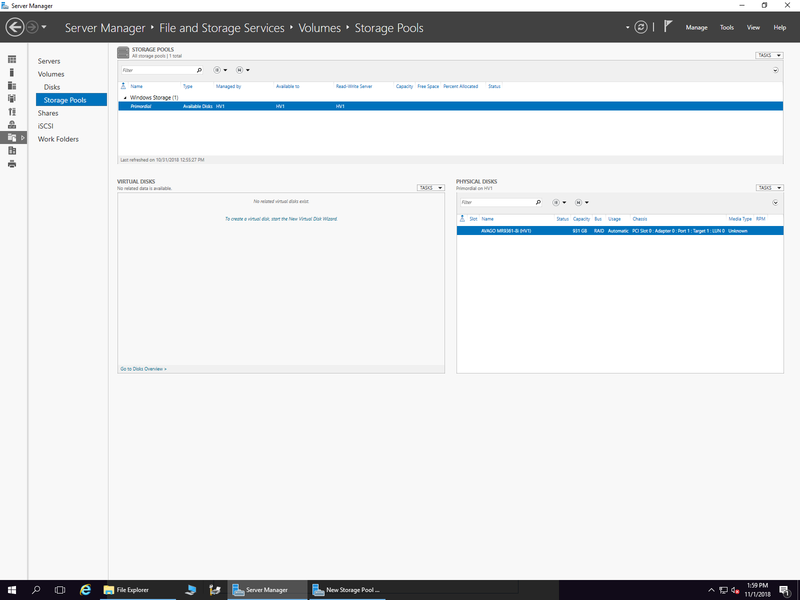 I am now setting up an Azure Backup Server as a VM on that machine. As per the instructions, the backup server needs a storage pool to use as a staging area. If it matters, HV1 is the hypervisor, the screenshots of Server Manager are from an instance of Win Server 2016 that is running as a VM on that hypervisor and acting as the primary (and only) domain controller, and the Azure Backup Server will also be a VM running on the same hypervisor. All three are part of the same domain. When logged into HV1 (command line only since it's a Core), the drive is visible as drive "E:", and diskpart shows it as an online disk with a small reserved partition (not sure where that came from) and the rest as a single primary partition which corresponds to the E: volume. Googling for this has not revealed any info, and, unfortunately, I'm far from an expert on this, but there's no one else who can do it. Any advice on how to fix this would be much appreciated. The first disk listed, the 931GB one, is the one I'm trying to add. Well, I seem to have figured it out, though it still seems odd to me. The problem was creating a volume. 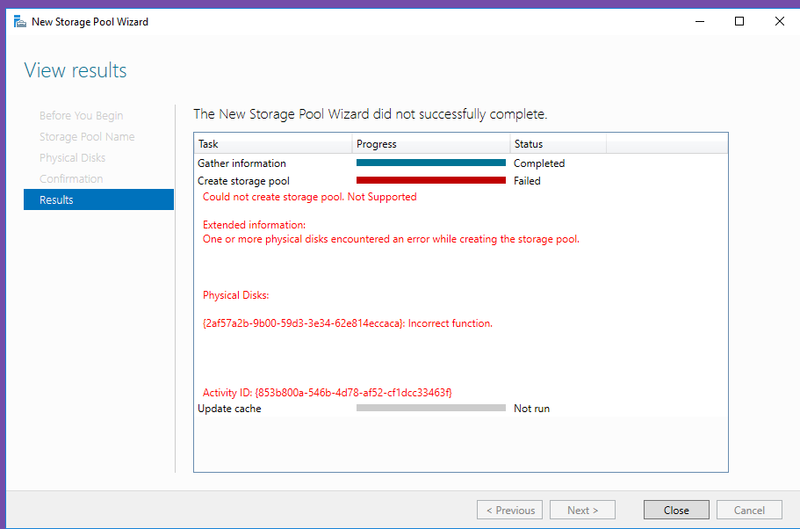 Apparently it needs a partition, but not a volume, in order to create the storage pool. I was unable to find this info, but arrived at the result experimentally, based on Stuka's comment that the disk must be erase. Not the answer you're looking for? Browse other questions tagged windows-server-2016 storage-spaces or ask your own question. Is there any way to prevent Storage Spaces Direct from automatically adding disks? Storage Spaces Direct - how to use newly added disk as local and prevent auto pooling / auto-select?